Gifts from the Pirates: "Fabulous secret powers were revealed to me the day I held aloft my magic sword and said... By the power of Greyskull!" "Fabulous secret powers were revealed to me the day I held aloft my magic sword and said... By the power of Greyskull!" 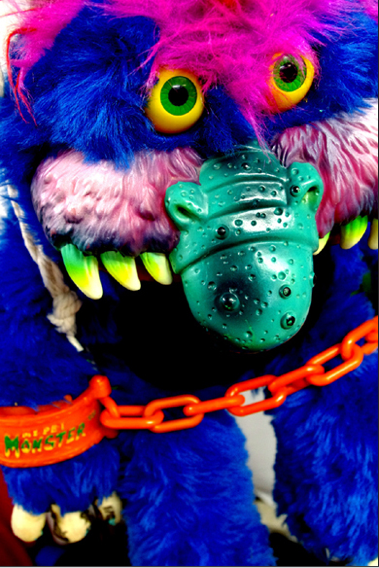 After mentioning my 'my pet monster' in one of my previous posts it got me thinking about all the toys i had when i was younger and how attatched to them i was. Although the boys have a lot of toys i don't think they feel the same about them as i used to of mine. Opeie's to young to understand at the moment anyway but I'm wondering if Seth will be like i was. I cant really remember how i felt about them when i was 5 but i know as i got to around 8-9 i loved my action figures. This post is just me reminiscing . I used to take this guy everywhere with me,he was quite large so if we were going somewhere where he couldnt be carried i also had the 'wogster' hand puppet as my smaller back up (not really sure why i would need a back up monster??). If i could find one of these brand new i would buy one for Opeie but their about 26 years old so i doubt that will happen. 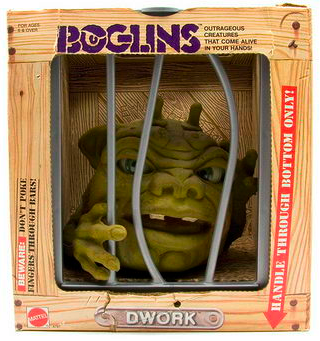 I remember me and my friends having Boglins and walking around trying to scare girls when they least expected it. The toys from when i was younger seem so much more interesting than the rubbish you get these days? a friend of ours son has got Bakugan figures?? whats that all about? theres nothing to them i really dont understand the fascination. 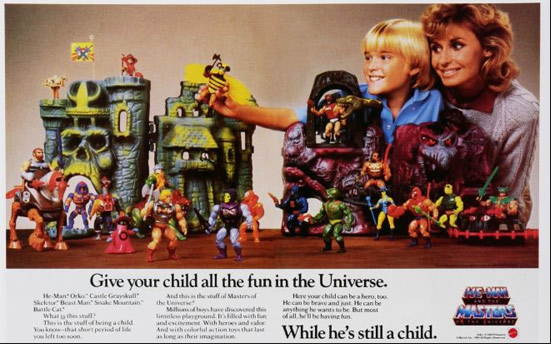 Other than my Star Wars figures my favourite action figures were my He-man collection, i had loads of them and they were amazing. I was really lucky that my parents did buy me a lot of nice things (it may have been to shut me up though but i cant really remember much my memory is getting worse as i get older). I do remember obsessing over the Moss Man figure though until i was bought it on holiday in Wales. It makes me laugh how the way i was hasnt really changed much over the years, i still obsess about the things I'm collecting. 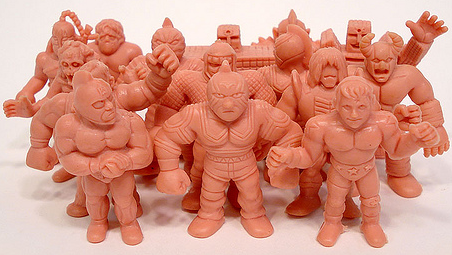 I think that my love of the Super hero squad figures stemmed from these guys, i had so many M.U.S.C.L.E figures and could usually be found taking a bum bag full of them around with me everywhere (it was the 80's i was allowed, plus I'm sure the bumbag colour scheme complemented the colours on my shellsuit). I have debated recently collecting these again but i dont think Seth would be all that interested plus i sometimes worry a little that by getting him into the things i like he's not included in the things some of the other children at school play with. Although he loves Star Wars so he'll always have William. I think if i did start trying to get hold of them it would be a little collection for myself. One year for christmas me and my sisters each got a werebear, these were great. 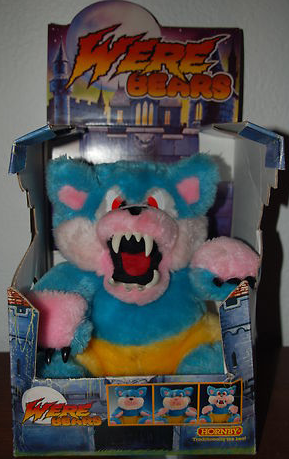 It was basically a care bear until you turned its head and hands inside out transforming it into an aggressive looking but still quite cute soft toy. Im kicking myself now that i don't still own most of my old toys but they were all just given away to younger children in my family. I recently watched 2 packs of the 80's Marvel Heroes and villains Top Trumps go for £150 which i had both of, its things like that that make me never want to get rid of any of the boys toys. I think were going to need a lot of storage. 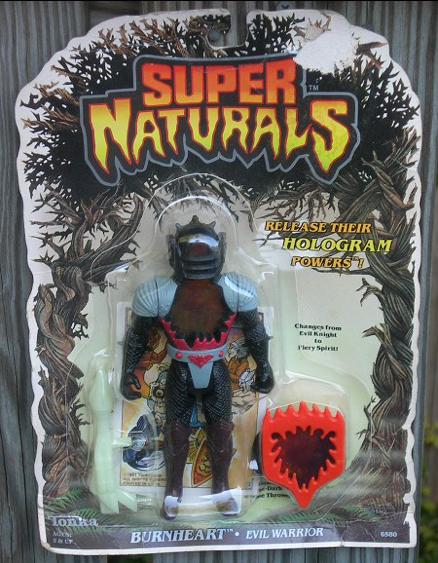 Thinking about it Im not sure why i liked Super Naturals so much but i had quite a few of these and Visionaries. I suppose there wasnt really anything else like them. I don't think my friends had any of these but to be fair i spent a lot of my action figure play time on my own. 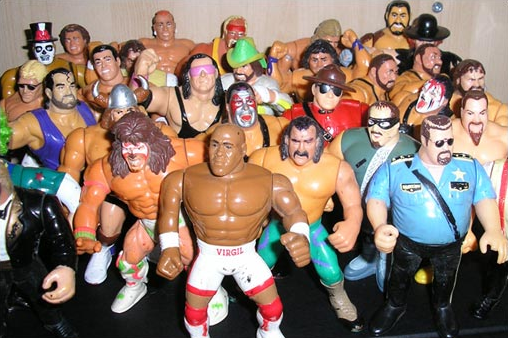 Watching the WWF Wrestling took up a lot of my spare time from about 12 onwards and obviously my love of the wrestling had to be backed up by a collection of figures, i was never bought any of the WWF figures from my parents, i got them all by swapping other toys for them. i wish i had a group of friends i could swap toys with now it might make my collections a lot easier. Although I'm not into wrestling at all now id love to still have my figures and I'm quite sure Seth would play with them too. My friend christian has hundreds of these along with belts etc (nice to know that I'm not the only geek out there amongst my friends). These are just the main toys i can remember playing with a lot but I'm sure as soon as i click publish ill think of a whole load more. There are some that i had briefly but they never really made a lasting impression on me such as M.A.S.K, Bravestarr, Micro Machines and Thundercats, i know these are all saute after but at the time they obviously didn't do it for me. It will be interesting to see if the boys get really involved in the blog because id really like to hear what they missed from when they were younger. The difference is i will have most of their things in storage so their reminiscing can be a little more hands on.